Calling all model enthusiasts who love a challenge! 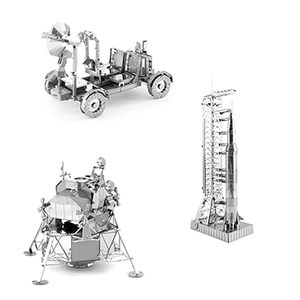 Celebrate the 50th Anniversary of the landing on the moon with our set of 3 models. While no glue is required, you will need your tweezers, modeling skills, good eyes or magnifier, and lots of patience to assemble the Apollo Lunar Module, Apollo Lunar Rover, and Apollo Saturn V. Models come on 2, 4” sheets and finish between 2 and 4”.